How Can I Reduce My Taxes in Canada? Home Personal Tax How Can I Reduce My Taxes in Canada? Note: A more updated version of this post titled “8 Ways to Reduce Taxes in Canada” is available by clicking here. This super credit is only available between the years of 2013-2017. A first time donor will be allowed to deduct 40% of donations $200 and under and 54% for donations over $200 without exceeding the maximum of $1000. To qualify as a first time donor, you or your spouse must not have claimed the charitable donation tax credit in any of the previous 5 tax years. For more information visit the CRA website to see how this super credit can reduce your taxes. Child care expenses include, but are not limited to, fees paid to a babysitter or nanny, daycare fees, costs for an after school program, PLASP fees, etc. They are deductible by the lower income spouse, even if the higher income spouse paid for the child care costs. The maximum amount of child care expenses that can be claimed is $11,000 for each child Born in 2015 or earlier and $8,000 for each child born in 2009 or later. You can minimize your taxes in Canada, by deducting fees paid to your accountant for preparing your individual income tax return. The accounting fees paid may be deducted from investment income, rental income, or business income reported on your tax return. In all other cases, accounting fees are non-deductible. As a salesperson, you can deduct any reasonable expense that you incurred for the purpose of earning commission income. To support your expense deductions, you must complete form T2200, Declaration of Conditions of Employment, and be required to pay for expenses related to your sales activities, as a condition of your employment. If you are required to use your personal car to carry out your employment duties, you can deduct expenses related to your car or vehicle. However, you must have a completed form T2200, Declaration of Conditions of Employment, and be required by your employment contract to use your personal automobile. Contributions made to an RRSP are deductible from your income. The maximum amount that you can contribute to an RRSP for 2016 is $25,370. The 2016 RRSP contribution limit is calculated as follows: (18% x 2016 earned income, plus any unused RRSP contribution room from prior years). Any income earned inside an RRSP is tax free. However withdrawals from an RRSP are taxable to you. To reduce your taxes in Canada, consider contributing to a tax free savings account (TFSA). A TFSA is an account in which any investment income earned is not subject to income tax. Unlike an RRSP, withdrawals from a TFSA are not taxable. Stocks, bonds, mutual funds, and high interest savings accounts can all be held inside a TFSA. In addition, the maximum annual contribution limit to a TFSA is $5,500 (2016). Note that contributions made to a TFSA are non-deductible. Another way to lessen your tax bill is by making a loan to your spouse at the Canada Revenue Agency’s prescribed rate of interest, which is currently 1% January 1, 2016. Your spouse could invest the loan proceeds in a business, high interest bearing investments, stocks, real estate, etc., and any income generated from those investments would be included in your spouse’s taxable income. The optimal amount of a spousal loan is equal to the amount that would equalize you and your spouse’s taxable incomes, after taking into account the investment income expected to be generated on the investments made from the loan proceeds. Making a spousal loan to a spouse who is in a lower income tax bracket is an excellent income splitting strategy. The children’s fitness tax credit, a.k.a. children’s fitness amount, is a tax credit available to Canadian taxpayers who enrol their children in a physical activity program. The tax credit is calculated as 15% of the amount paid for a physical activity program. The maximum credit that can be claimed is $500 if your child is under 16. The receipt for your child’s physical activity program should say whether the program qualifies for the children’s fitness tax credit. Note: This credit will no longer be available in 2017. A) Question: Can I claim parking fees on my tax return? You are an employee and paid for parking to visit a client, supplier, or in connection with your employment duties. Amounts paid for parking at your place of work are non deductible. B) Question: Can I deduct interest paid on a loan to purchase stocks or other income producing investments? Yes, you can deduct interest paid on a loan to purchase stocks or other income producing investments. The interest paid should be deducted on Schedule 4 of your personal tax return. C) Question: Can RRSP contributions reduce my income tax bracket? Yes, RRSP contributions can reduce your income tax bracket. The amount of RRSP contributions that you must make in order to reduce your income tax bracket is equal to: Your taxable income before RRSP’s minus the threshold for the next lowest tax bracket. To find out what the threshold is for each income tax bracket, see What are the income tax rates in Canada for 2016? D) Question: Which employment expenses can I deduct to reduce my employment income for tax purposes? For more information on deducting employment expenses, see How Do I Save Tax in Canada by Accountants in Oakville? E) Question: I’m self-employed. How do I reduce my income taxes in Canada? If you are self employed in Canada, there are many ways to reduce your income taxes in Canada, especially through tax write-off’s. For more information on reducing tax for self employed individuals, see How to save taxes for self employed in Canada? F) Question: Are there ways to reduce corporate taxes in Canada? What Do You Know About Canadian Tax Shelters? Can you further explain how the spousal loan works? I am the higher income earner but howe does providing a loan to my spouse reduce my taxes? If I would like to contribute $5000 to my TFSA, do I need to wait for certain period before I invest to the stock or other similar investment. Also, how to take those money to invest? Do I need to open another investment accounting? There’s no minimum time period that you have to wait to invest. The TFSA that you opened with your financial institution should allow for trading of stocks, bonds, etc., if that is your intention. I am self employed. Is there a way to get EI in case I run out of clients ? It is very important that to point out that self-employed contractors are NOT eligible for general EI benefits. If you are unemployed, you will not receive EI. You will be always required to provide proof to make claims. I was just wondering with respect to child expenses can we deduct any amount for physical activity. We have the boys in hockey right now. Yes you can via the children fitness tax credit. You can deduct up to $500 for each child under the age of 16. Hi I was just wondering if I wanted to transfer my RRSPs to a TFSA could I do that and are there any tax consequences as a result? Unfortunately Mary it makes little sense to do this. For two reasons one You can only contribute $5500 to your TFSA each year. The second reason is even if you transfer to a TFSA the withdrawal is not tax free. You will still be required to pay taxes on the withdrawal. You are best to keep the money in the RRSP or just withdraw normally and pay the according taxes. I am moving residences this coming year. I am moving from Toronto to Calgary. I am driving myself and getting a truck to take my belongings. I was just wondering if there is any deduction the government gives us if we are moving long distances? Yes there is a deduction called the moving expense which allows you to deduct part of your travel if your new house is 40 km away from your old residence which it is in this case.You can deduct Vehicle expenses, meals, accommodations, cost of maintaining your old house, and a few others. Is it possible to deduct healthcare expenses not covered by the Ontario Health Insurance Plan? Yes, even healthcare expenses that are only partially covered by OHIP can be deducted. What if I made a loan to who is now an ex-wife, but was legally my wife when I gave her the loan. Would the same rate of interest still apply? Since she was legally your wife at the time of the loan, the same rate would still apply to her. What is the total TFSA contribution room? IF you were at least 18 years of age in 2009 when the TFSA was first establish then your total contribution room for 2014 would be $31,000. Can I make TFSA contributions as a non-resident? Great page. Thank you for the advice. As an inside sales person who makes a salary and untaxed commissions, am I best served to match the amount of my commissions into an rsp to avoid taxes? Any downside to this? Yes, you should certainly consider making matching RRSP contributions up to your RRSP limit for the year. This will provide you with some tax relief because RRSP contributions are tax deductible. I am placed in a very high tax bracket because I receive annuity payments monthly. Currently I receive over $2,900 per month and pay taxes in quarterly installments. I do work full-time as well, and have never lived on disability and/or welfare (even though I am physically disabled due to a doctor’s extreme poor judgement before I was born.) The annuity increases my taxes astronomically and I am struggling to pay taxes because of this. I cannot afford a lawyer and accountant to look into this. I live on very little income just to pay my taxes so there’s no much left with lawyer or accountant fees. RRSP contributions made by your employer (at their own expense) are treated as a taxable benefit to you. The taxable benefit is reported on box 14 and box 40 of your T4 slip. If you have sufficient RRSP contribution room available, you can make a deduction for the amount your employer contributed to your RRSP. Currently I am employed. I would like to borrow some money around $20,000 from my brother who is in US and employed. What would be the safe mode to transfer this amount in order document for taxation purpose. This money is for my house hold support only. Is it exempted from the tax? Loans received by residents of Canada are not subject to Canadian income taxes. A loan agreement should be prepared specifying the terms of the loan, including the interest rate applicable, and repayment period. Ordinarily, interest paid to a non resident of Canada would be subject to Canadian withholding taxes. However, pursuant to the Canada US Tax Treaty, the withholding tax rate has been reduced to 0% on interest payments. Instead of health/dental insurance, I have a Personal Spending Account at work, where I can get reimbursed for child care expenses. The reimbursement that I receive is taxable. Can I still claim my child care expenses on my income tax? So long as the monies reimbursed to you for child care are included in your T4 slip as a taxable benefit, you can deduct the amount you paid to a child care provider on your personal tax return. You must ensure that the child care expenses paid are qualifying expenses for the purposes of the child care tax deduction. If I have 2 kids, and I spent $1000 on sports for one, and $100 for sports on the other. Can I split the amounts and apply $400 from the one and apply it to the other one where I only spent $100? No, you cannot split the receipt, unless it relates to both children. I am planning to take a sabbatical to France in a couple of years and am wondering about any tax benefits. Are there any? If so, how do I ensure that my leave of absence is acceptable to the CRA? A leave of absence allows you to defer tax on up to one-third of your income for a full six years, and it works this way. You set aside up to one-third of your salary each year for up to six years. Your sabbatical must begin no later than six years after the deferral begins, and it must be at least six months in length. If you are intending to attend an educational institution full-time, it must be three months. You’ll have to return to your workplace for at least as long as you leave, and you’ll have to pay tax on the deferred income no later than the seventh year weather you took the leave or not. To be accepted by the CRA, you must get your employer to document your plan in writing. Also, deferred money has to be used to fund a leave of absence and not a savings plan. Hello Allan. Coming off of a harsh winter, I am looking to buy a cottage to spend my summers. I am self-employed, and will use the cottage to entertain clients. Are there any other considerations that I might be able to claim for a deduction? As your second home, your cottage will not be covered by the principal residence exemption so you may have to pay capital gains when you sell it. If you are doing any renovations, make sure you keep all receipts. You may be able to use these expenses to reduce the gain. As you are self-employed, there are several other things that may apply to you. If you head straight from your meeting to a cottage, make sure you track your miles as these may eligible for a deduction. However, you can only claim the portion related to business. If you have alcohol in your fridge, you may be able to claim 50% of it as an entertainment expense but only if you are using it to entertain clients. Finally, if you happen to receive a bad sunburn, you may be able to claim any prescriptions you receive as treatment. Hi Allan, I’m thinking of moving to a new city to be closer to work. What are the tax rules when it comes to moving? Is there a minimum distance I have to move from my current home? •	Costs relating to changing documents to reflect your new address, replacing driver’s licenses, auto permits, and utility connections and disconnections. You should plan your move so that your new home is within the 40-kilometer range. If you’re a student, you should note that research grants count as income in your new-location. I’m a priest of a church in Alliston, Ontario. My house is provided by my church. Am I eligible for any deductions? If the utilities of the home were included with my income, can I submit these for a deduction? What form do I fill out? A) Either one-third of your total payment from the office or employment or $10,000, whichever is greater. B) The fair rental value of the residence (reduced by other amounts deducted in connection with that residence. You are also now required to file a prescribed form with your income tax return that will be signed by your employer. This is to verify that you meet the requirements of a clergy member. As your employer provides you with a residence, you can deduct all amounts that were included with your income with respect to that accommodation (including utilities). However, the deductions you claim cannot exceed your income for that year. The form that you are looking for is the T1223, and you can find it here: http://www.cra-arc.gc.ca/E/pbg/tf/t1223/t1223-13e.pdf. Hey Allan, If I give my husband money to pay for his TFSA, do I have to structure it a spousal loan? If I do it this way, he would have to pay me interest and I would have to report it. I called the CRA, but the agent I spoke to wasn’t very familiar with TFSA’s. He told me that I want a definite answer, I have to write the Income Tax Rulings Directorate. Do you have any advice for me? Normally, the attribution rules in the Income Tax Act block attempts at splitting income or capital gains between spouses or partners. It does this by attributing such income or gains back to the original spouse or partner. However, there is a special exception to these rules regarding gifts. These regulations state that the rules will not apply to any income or gains earned in a TFSA derived from a gift in which the holder contributes to their own TFSA. Several times a month, my daughter travels from Toronto to McMaster University in Hamilton. She uses the Presto Card to take the GO Train. Also, my wife sometimes uses a different pass to travel around the city to do errands. Could they qualify for some sort of credit? If they do, how is the credit calculated? Presto is a pay-per-use system. Provided their Presto cards are registered, there is a minimum usage that your daughter and wife must meet. They need to have taken at 32 one-way trips within any 31 day period. The credit is calculated by taking the total cost of the passes, and multiplying it by the lowest tax rate (15%). You can get a yearly transaction usage report on this page: https://www.prestocard.ca/CustomerManagement/TransitUsageReport. For more information, please visit https://www.prestocard.ca/en-us/pages/contentpages/faq.aspx. Currently, I am saving to buy a house. I have a full-time job already, but I’m thinking of getting a second one to bring in more money. This would be 16 hours a week to my 40 hours of my full-time job. All of my friends tell me it is a bad idea, because I would be paying a larger amount of tax. I’m thinking of buying a tax software to sort out my situation. Should I take on the second job, from a tax perspective? Having a second job may put you in a higher tax bracket, which would raise your marginal tax rate. Both employers will continue to deduct taxes from your paycheques as if you only had one job. Therefore, you will end up with more take home pay, but you may have to pay extra taxes when you file your tax return. At the same time, it might result in lower payroll taxes if you are close to the cut-off point. The first thing to do is calculate the gross take home you would be earning. For 2014, the second federal tax bracket is taxed at 22%. It starts at $43,562. If a second job pushes you over the first bracket ($43,561), your marginal tax rate goes up. If you do take the second job, be sure to accurately report your other income. If you don’t your other employer may withhold too much tax, CPP, and EI. Just wondering about claiming parking on my tax return. You said you would be able to claim parking expenses on your taxes if it was in connection with your employment duties. You also said that amounts paid for parking at your place of work are non-deductible. Wouldn’t employment duties mean doing work, at your place of work? Or does the term “employment duties” mean only if you are travelling anywhere away from your place of work? I only ask this because I am currently interning at a radio station and they don’t offer much parking (it’s in a downtown of a major city) so the only parking is paid parking near the building. This is fine since the parking is relatively cheap, but it does add up. I was wondering, since I’m not getting paid for this work but still have to pay for parking, would I be able to claim it on my taxes? No the Income Tax Act specifically excludes cost of commuting (including parking at your place of work) as part of eligible parking expense that is deductible against your employment income. Similar argument could be made by those who use public transit to commute if they can deduct those expenses as employment expense since they need to commute to work – which the answer is no. Furthermore, any employment expense is deductible only against your employment income. Therefore, if you have no employment income, you would not be able to deduct eligible parking expenses anyways. Hello, spousal loan works if you are in a significantly higher tax bracket than your spouse. In this instance, you can lend the money to your spouse at the CRA’s prescribed rate (currently it’s at 1%) and your spouse can use this money to earn investment income. Since it will be your spouse earning the investment income, the tax rate applied on such income will be his marginal tax rate. You can do this by creating a promissory note between yourself and your spouse. I highly recommend that you run this strategy by a professional before proceeding however since terms and conditions apply. If your spouse will use the money for non-investing purpose (eg. For education), then you don’t need a spousal loan. You can simply give the money to him or pay for his education yourself. No tax implication. I am planning to move to Canada on PR from a South Asian Country., I have secured a Job In BC. However, I am concerned about the taxation on interest on my savings in my Home country. Do I have to pay tax on my worldly income such as interest from savings? is yes, How do I reduce or stop paying tax on the above mentioned income. If you become a resident of Canada, you will be subject to Canadian tax on your worldwide income, including foreign interest income. However, you will be able to claim a foreign tax credit in Canada for any taxes paid on foreign income to avoid double taxation. When my father visited us in Vancouver he got sick and was hospitalized (no insurance) and I have to pay the hospital bills (a significant amount). I am making a monthly payment to the hospital even my father is already back in the U.S. Just wondering if I can file this to my tax return. You will be able to claim medical expenses for your father if he is considered an eligible dependent. Please refer to link for more information on whether you can claim him as an eligible dependent. I am from the UK, but I rent a condo in Canada with my girlfriend and work offhsore in Brazil for over 7 months a year. my question is at what stage will I have to pay tax in Canada (married/kids/buy a property). Also is there any exemptions due to me being out of the country for such large periods of time? Sorry for the delayed response in our reply. You would not be considered a Canadian resident for tax purposes as long as you do not work here in Canada. Since you live/work outside of Canada for more than 183 days you would be considered a non-resident. If you were to get married then you would be considered to have an established home in Canada through your spouse. This would make you a resident of Canada for tax purposes and you would be taxed on your world wide income. If you live in Canada for more than 183 days during the year you will also be considered a resident for tax purposes and be taxed on world wide income. If you have any other questions please let me know. I am from India and working in Ontario on a work permit. I am being paid monthly salary. I am here with my family for a year only i.e from July 2014 to June 2015. How can I file my income tax return and get maximum refund. I have come to know from your article that I may deduct the travel expenses from my personal income. I am interested to know whether can I deduct the travel expense (air tickets from India to Canada) of my whole family. Also I need to know whether I can also use my hotel bill for the same during the same time. According to the India-Canada tax treaty, if your permanent home is in India, you will be considered a tax resident of India. However, if your permanent home is in Canada, you will be considered to be a resident of Canada. You can deduct moving costs (your airfare) against your Canadian employment expenses. I am permanent resident in Canada and in high earning bracket. I have one kid and wife but they still still in UK and in process of immigration. my wife does not work there and look after our daughter. I do have to support them financially. Just wondering what option I have to reduce my taxable income as at the moment I am paying extra ordinary amount with no benefit to to my spouse or kid which I feel very unfair in this taxation system. If it cannot be determined still with these rules, then the authorities settle the question through mutual agreement. You have to apply the rules in order, starting from the first. You can argue that your ties with the UK are stronger as your spouse and child are in that country, but without further information I cannot provide a conclusive answer. For now it appears that you may be a resident to the UK. The treaty in place does prevent double taxation however you still have to pay tax to Canada on your Canadian employment income. Does this include self employed (unincorporated) physician earning professional income? Would I be able to deduct my parking pass that allows me parking at two different hospital sites that I provide services to, as an expense against my professional income? If yes, do I report it on line 9281 under motor vehicle expenses, or on line 9270 as other expenses on my T2125? Thanks in advance, and great blog Allan. You can deduct the full amount of parking fees related to your professional activities. Reporting parking fees on line 9281, “Motor vehicle expenses (not including CCA)”, in Part 5 of Form T2125, Statement of Business or Professional Activities. I received a travel expense for trips in/out from Alberta/Ontario for working 2 weeks in and 1 week out, camp work for an 8 month period in 2014. The money received did not cover the total expense. Am I allowed to expense the difference and, if so, what form do I fill out. Can I claim a vacation once a year? Unfortunately, you cannot claim a deduction or credit on your tax return for vacations. I married my spouse in mid-2014 and submitted his application for PR in November 2014. He is currently not working and has not yet been approved to immigrate to Canada. I started supporting him financially in February 2015. Would I be able to claim him as a dependent for tax purposes when filing taxes for 2014? If so, what documents do I need to show that I supported him? i have traveled twice this year to India from Canada, i am currently on work permit in Canada and not a permanent resident yet my question to you Allan is that next year when i file my tax can i claim for my airfare to India? Your answer would be appreciated..
You had to travel to India for work related business and were required to pay your own fare or travel expenses and have your employer verify this by having them sign a T2200 form. You must also not have received any allowance for travel costs. If an allowance was involved, that amount would actually be included in your taxable income. I just recently converted an investment account to a TFSA under the same bank. Will I be taxed by doing so? I didn’t withdraw anything but just kept it in the same account. I didn’t receive any tax forms from the bank either. Hi – I know I’m not able to deduct parking tickets from my business income, but am I able to claim legal fees to fight and/or file these tickets? Thanks in advance. First of all congratulations for supporting such an useful website. It is an invaluable job that you do. I have been working in Alberta for 1 month now and I will do it for hopefully two years at least. I am contracted and I am sending money to Spain to support the basics of my wife and my daughter education. I use a car to go to work daily and I have rented an all included house but internet. I am wondering what and what not of my spends could help me to claim taxes, also I am wondering whether or not bring back my (daughter age 16) and spend money in her education. Could you please let me know in short what is the proper way to reduce my taxes?? My name is name is Joi Khan and I am from Toronto. I had a question about the medical expense tax credit. My husband and I have been trying to have children for quite some time; we recently found out I am unable to bear children. We were considering in-vitro fertilization and egg donor procedures…however that is quite expensive.Essentially, we want to know if the payments for the in-vitro fertilization and egg donor procedures are eligible medical services for the medical expense tax credit. Unfortunately no – because the egg donor or the surrogate is not a dependent of yourself or your husband, you would not be eligible for the medical expense tax credit. The medical expense tax credit are only eligible to those who are: a child, grandchild, parent, grandparent, brother, sister, uncle, aunt, niece, nephew, of yourself or your husband. If this person is a dependent, then the amount you pay to a medical practitioner, or a public/private licensed hospital for medical services is a medical expense that applies to the medical expense tax credit. As well as the amount paid for drugs, lab/diagonostic services and procedures. I recently had surgery on my leg and I am recovered now. However, my leg still gets very stiff and I was told it would not go back to normal conditions. To relieve my physical pain I use a hydrotherapy pool which aids my discomfort. Would using the specialized pool be applicable for the medical expense tax credit? We researched subsection 118.2(2) (1.9) of the Income Tax Act, which lists the types of medical expenses eligible for the tax credit. This section of the act does allow certain expenses for therapy when a patient is in prolonged and severe impairment. However, it is evident that the fees paid to access the facilities of the pool are not shown in 118.2(2) of the Income Tax Act, therefore it would not be eligible for medical expense tax credit. Thanks for contacting me. Medical expenses are personal and not related to your business. Therefore, medical expenses should be paid by you. You can claim a medical expense tax credit on your personal tax return. Hi, I live in Ontario. My daughter is getting some chiropractic treatments not covered by my health insurance plan or OHIP can I claim them on my income tax return. How about orthodontic treatments? Fees paid to a chiropractor or orthodontist are qualifying medical expenses for the purpose of the medical expense tax credit. You can claim them on your personal tax return. I thought I heard somewhere you could claim parking at hospitals on your income tax. Aside from the 40km thing. Is that not so? Hi, I rent a apt and need to pay addtional cost for a monthly underground parking. Can i claim a tax return for that? Would that be a part of the rental I report? Rent paid for a parking spot is nondeductible for tax purposes if the parking spot is for personal use. My wife sees a therapist and pays for parking. Can the parking be claimed as a medical expense? Thank you! Parking can only be claimed for the medical expense tax credit if your wife has to drive at least 40 KM to see her therapist. You can’t claim a tax deduction for the cost of textbooks that you purchase for college or university. BUT, you can claim a tax credit for textbooks. The amount of the tax credit is determined by multiplying the number of months that you were a full time student in the year by $65. For part time students the formula is reduced to $20 / month. NOTE: You must receive a Tuition Tax Slip from your college or university to quality. For example, if you attended University on a full time basis for 8 months in the 2015 calendar year, then the amount of the Textbook Credit is $520 (8 months x $65 / month). Your blog is a good learning tool. Anyway, follow-up question on “parking fees”. I work at the hospital (RN) and got a parking pass, can i claim my parking fees? If yes, where can I put that and how to claim previous years? My second question, I brought my mom here in Canada (on a parents supervisa) from Philippines so that the can he look after my daughter and I can work full-time. Can I claim her airfare, visa fees& health insurance as child care expenses? My mom did not ask for any payments. It is in our culture that grandparents can babysits grandchildren. Paying to park your vehicle at or near your work location is a non-deductible expense for tax purposes. In response to your second question, travel related costs for bringing your mom to Canada to babysit your child is not an eligible child care expense. Unless both you and your husband sever your primary and secondary ties with Canada, you will both be considered tax residents of Canada. Tax residents of Canada are taxable on their worldwide income. Hi ,my husband got job in middle east in2015 before he was jobless ,now he is earning , iam jobless and take care of my kids ,now how I will file my husbands earnings and what documents I will be needing for assessment , i am renting an apartment here in gta.thankyou in advance. Hi ,my husband got job in middle east in2015 before he was jobless ,now he is earning , iam jobless and take care of my kids ,now how I will file my husbands earnings and what documents I will be needing for assessment , i am renting an apartment here in gta ,last year I went with my kids to visit him also her also travel twice a year to Canada and once to our home country,pls give me some advice on my situation.thankyou in advance. Your husband will be classified as a resident of Canada, because you, his children, and his apartment are all in Canada. As a result he will have to report his income from the Middle East on line 104 of his personal tax return and pay Canadian income taxes. He can claim a spousal tax credit for you since you have no income. My friend told me to get a investment loan and invest in the seg funds and then you CAN deduct the interest paid for your loan from your gross income and the growth in the investment is tax free. Segregated funds held outside of a life insurance policy are not tax sheltered. So you can deduct interest on money borrowed to invest in segregated funds held outside of an insurance policy. However, interest paid on money borrowed to invest in segregated funds held inside an insurance policy is non deductible. my wife is not working. can i pay my son as child care expenses for looking after my daughter who during summer when he comes home from university in another province in Canada. Can i claim flights and accomodation as moving expenses for my son who studies in another province? how can we reduce taxes for supporting his tertiary education. Child care expenses can only be deducted by the lower income spouse. Since your spouse has no income, she won’t be able to claim a tax deduction for child care expenses. Your child can claim moving expenses on his/her return so long as they moved at least 40 kilometers closer to attend school. To reduce your personal taxes, consider having your child transfer the maximum allowable amount of tuition credits from his/her return to you. For the past couple of years my spouse drives my car for her work and does have a T2200 for employment expenses can she claim CCA and related interest expense related to the vehicle? Yes, if she has a signed form T2200 from her employer, she can claim CCA on her vehicle and interest on a loan made to purchase her vehicle. 1) my wife is not working and taking care of my 3 years child. 2) can I apply for child tax benift and ucbb ? 3) any other tax benifit as new immegrant ? Thank you for contacting me. Complete form RC66 to apply for the Canada Child Benefit http://www.cra-arc.gc.ca/E/pbg/tf/rc66/rc66-15e.pdf The UCCB is being eliminated as of June 20, 2016. 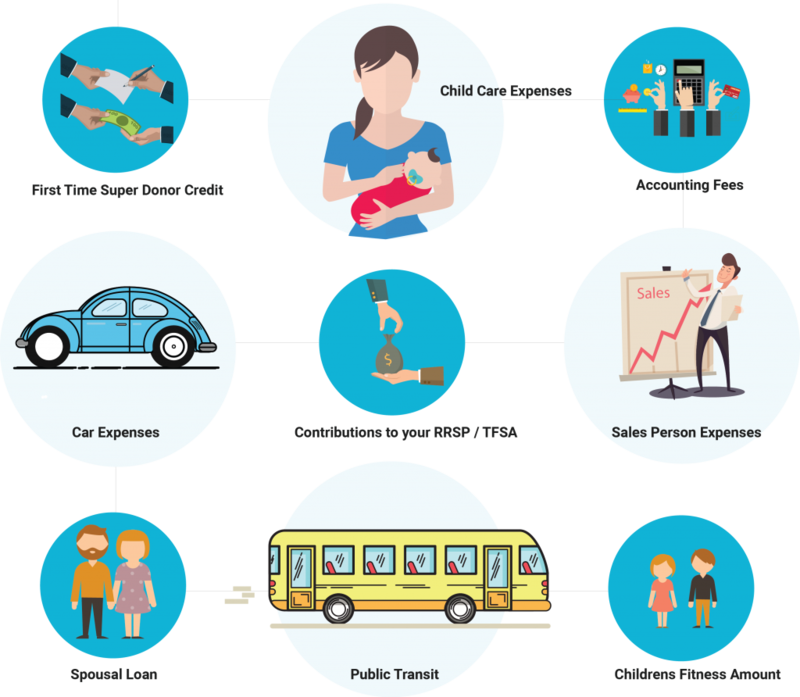 Child care expenses such as daycare, babysitting fees, payments made to a nanny, etc, can only be deducted by the lower income spouse. Since your wife has no income, she cannot take advantage of these deductions. For the 2016 year, you can get a tax credit for expenses related to children’s arts and fitness programs. I wish to transfer CAD 50, 000/- as Loan from a bank in India against some collateral’s, would I have to declare this to CRA? I came to Canada in 2015 but was unemployed until May 2016. Prior to coming to Canada I worked in the gulf for 10 years. Your assistance in the matter is highly appreciated. You do not have to report a loan payable by you on your tax return. However, if you have assets located outside of Canada having an aggregate cost amount of $100,000 or more, then those assets must be reported on form T1135. Is there any booklet that explains ways to save tax that can be purchased ? Thanks for your question. You can learn more about saving taxes, by downloading by free e-book from Amazon called Tax Tips for Canadians. Is there a taxable benefit if I live in a house owned by my company if I am not paying rent to my company? If so, is there a way to offset this taxable benefit such as putting it against shareholders loan? Yes, there is a taxable benefit equal to the fair market value of the rents. Even if you offset against a shareholder loan payable, the taxable benefit will remain the same. I got married in the middle of this year (september). For this year’s tax return, if I were to include my spouse’s transit pass for my return since she did not have a lot of income, can I only use transit pass from September (the month we got married) to December or entire year? Hi, my wife does not work and we have two kids. We have paid an air ticket for my mother-in-law to come and stay with us for 6 months so she can help my wife with younger kid while she takes the older one to activities or to pre-kinder garden school. We did not pay her for the help, but as I said we paid for the ticket and medical assurance coverage. Can we claim these expenses? No, you cannot claim these as expenses. Say I am employed with a company and I wanted to use a portion of my income… say to partner with a friend in a restaurant business. Is that portion of income I invested is still taxable. Hi, Samir. Yes, the portion of the income that you used to make an investment is still taxable. I will be possibly working in Dubai, UAE. I have a home and investments in Canada that I would like to keep, so I will be a resident for tax purposes in Canada. As UAE is tax free country, I will have to pay large taxes in Canada. What items could I deduct while living in Dubai? Airplane tickets to and from Canada, home rental in Dubai, car, utilities etc?? Hi Justin, you’re in a bad situation from a tax perspective. Your full income + benefits (e.g. housing allowance, car allowance, etc.) will be fully taxable to you in Canada. You cannot claim a tax deduction for personal expenses – food, flight tickets, rent, etc. Should the person with the higher or lower income claim medical expenses? Generally speaking, it’s better for the lower income spouse to claim a tax credit for medical expenses. This is because medical expenses over 3% of a taxpayer’s net income for the year are eligible for a credit. The lower the net income, the more that can be claimed for tax credit purposes. Why do LLCs Result in Double Taxation for Canadians? Am I Eligible to Deduct Home-Office Expenses?